I was eating brunch at a restaurant, in Fresno, this last week and breakfast potatoes that were hard and seemed undone. 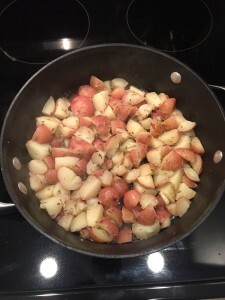 If you have ever had this problem with your potatoes, here is a guide for making the perfect potatoes. This technique doesn’t have to be just for breakfast potatoes, I use it for scalloped potatoes, au gratin potatoes and for many other recipes. The primary key is to boil your potatoes first. Which leads me to another (related) topic. Many home cooks don’t realize the flavor you can incorporate in to foods when boiling. There aren’t many vegetables I boil, but when I do, I always season my water. Yes, that’s right; season the water. At a minimum, always include salt in your water. When I am parboiling potatoes, I include Thyme, Rosemary, Garlic and Onion. I will dice 1/2 a yellow (Spanish) onion and 4 garlic cloves. For boiling water, I use dry Thyme and Rosemary. Remember, you can use any spices and herbs you wish to impart in to the food you are boiling. I usually boil potatoes for 15 to 20 minutes allowing them to get soft but still firm. Remember we are parboiling them. Once complete, immediately transfer them to a colander and allow them to drain. Don’t rinse them as this would make them soggy and remove the dry spices/herbs you added to the water. I prepare my frying pan with about 1 tbsp butter and 2 tbsp peanut oil. For this application, peanut oil or avocado oil is best because they have a higher smoke point. If you want a nice crisp on your potatoes, which is my favorite, avoid olive oil as it has a very low smoke/burn point. Bring the oil to a high heat. You want to see the oil/butter glisten. Then toss in the potatoes. Add a liberal amount of salt and allow the potatoes to become crispy. Don’t add pepper yet. Did you know that pepper will burn and become bitter? 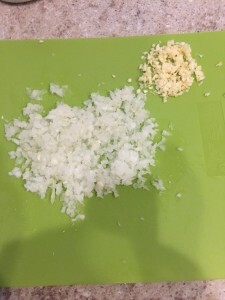 In a saute pan, cook the other half yellow onion and another 2 (finely chopped) garlic cloves. At this point you can also saute red and green bell peppers if you wish. 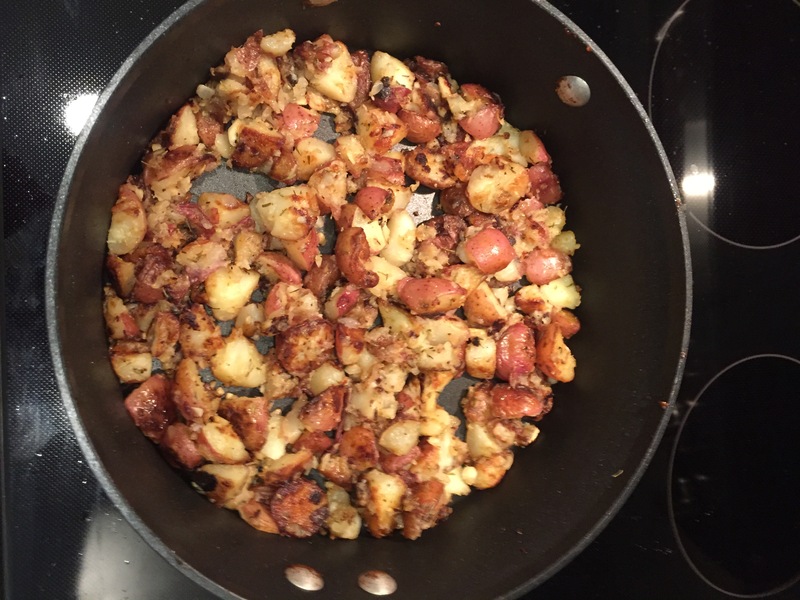 In addition, feel free to experiment; cook some fresh chorizo, linguica, bacon, ham, pancetta, or anything else you would like with your potatoes. 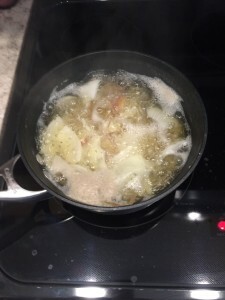 Once your potatoes are nice a brown, add the saute onion and garlic, toss to incorporate. 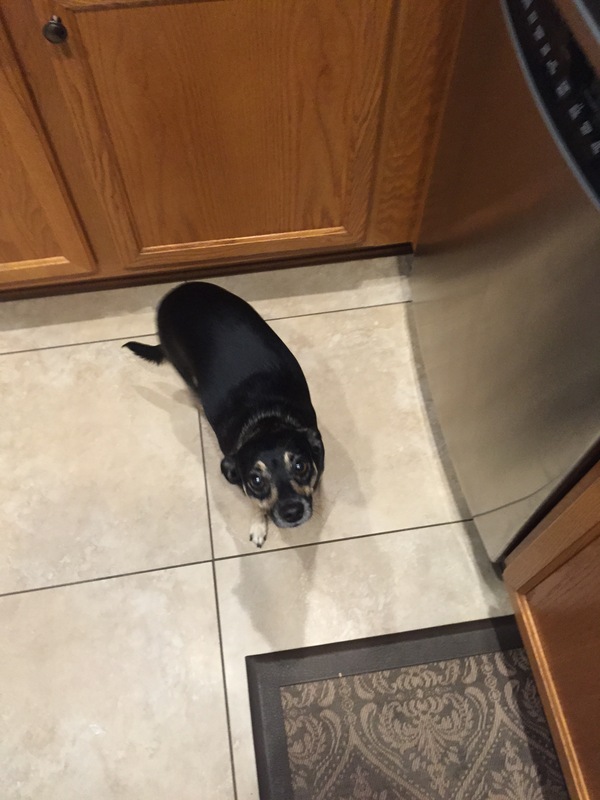 At this point, your dog(s) may join you in the kitchen, begging for a nibble! Potatoes aren’t difficult to cook at all. The key is a few simple techniques and the result will be crispy on the outside, delicious and tender on the inside morsels of yummy potatoes. 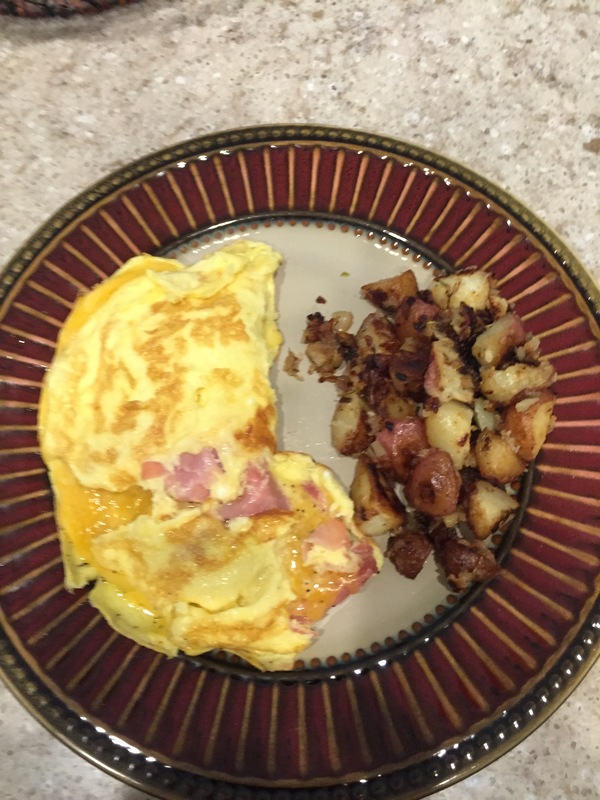 Serve them with an omelet and you have a perfect breakfast. These look great, although as an Idaho boy I must scold you for not using russet potatoes! I agree with you though, the worst thing is to get hash browns that are underdone. And by done I mean brown! Not too harsh a scold I hope! I use Idaho, Yukon and Red potatoes; depending on my mood. Idaho potatoes are wonderful and I find a bit more firm. If you want a crispy exterior and creamy interior I’ll use Yukon or Red. Otherwise Idaho are wonderful. And as for the level of doneness, I also like them done/done/done. I like my potatoes brown as can be!